Last Day of Work loves virtual sims. I mean seriously loves them, at least according to their lead designer. And, well, their product line, which includes the massively popular Virtual Villagers series. For those of us who love messing with the lives of little virtual people without all that faffing about on an island, Last Day of Work created Virtual Families, a game that features all the animated people without all the exploding volcanoes. Now they've come out with a sequel to that fabulous game, Virtual Families 2: Our Dream House, which deepens the gameplay of the original in new and interesting ways! 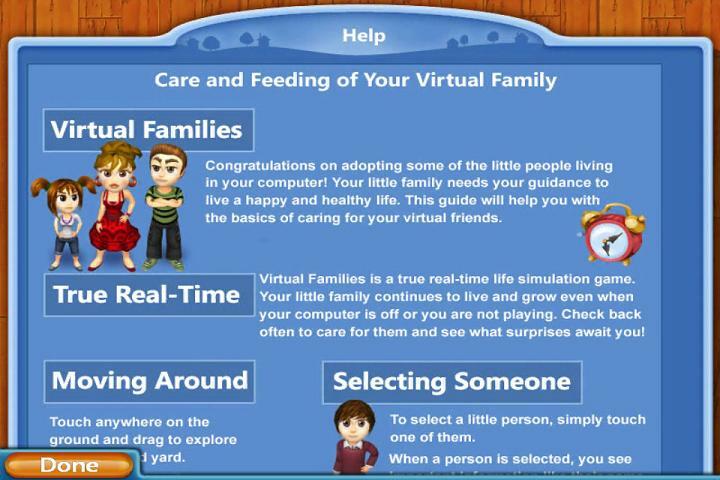 Virtual Families 2 begins, as many families do, with a single person and a place to live. Once you've chosen a character to start things with, your next goal is to get them working, marry them off, encourage a few children to spring along, and help take care of the wreck of a place the family calls home. Each person has their own individual looks and personality, and careful consideration of their quirks is the first big decision that you need to make in the game. Folks that don't want children, for instance, can be difficult to persuade to produce the next generation, which is pretty important if you want to keep the game going. The house itself comes with only four usable rooms, everywhere else is a toxic wasteland, a critter cavern, or just a burned-out wreck that needs time and money (or know-how) to fix it up. The house (and surrounding yard) are also littered with, well, litter. Lots of effort is needed at first to make part of the house clean and inhabitable, and as the game goes on you can eventually renovate rooms until your little folks are living in their dream house. Money can be earned by the adult family members as they work at their careers. Money also comes in as a reward for each trophy you gain, for completing a tutorial task, or with e-mail as a random event. Use the coins to buy food for your family so they don't starve, and the upgrades needed to make the house more habitable or their jobs easier. As your little folks get on with their lives you can affect their habits and their environments in a variety of ways from conditioning them to perform certain tasks to buying them upgrades for their workspaces or leisure. Each family is unique and a product of your imagination and the various upgrades available to affect their behavior and living conditions. As long as the next generation shows up your family can keep going in an endless cycle of birth, life, and death, providing countless hours of entertainment. Analysis: The original Virtual Families was fun but rather limited in an important aspect of the game: the environment. Most of the rooms had a specific and fixed purpose, and even though the characters themselves were varied, the living space remained stagnant most of the time. Virtual Families 2 fixes this problem with movable furniture and room renovations that can become anything your imagination can conjure. Kids' rooms can even be repurposed once they grow up and move out, allowing you to set up that media room you always wanted. There are also new and improved ways to interact with your characters, such as upgrades that help advance their careers or re-train them in an entirely different field. New collectibles will appear in the yard and there are new trophies to earn, new jobs for your little folks, and a ton of furnishings and accessories that can be purchased in the store, which has gone from a single screen place that sold groceries, medicines, and the occasional other item to a multi-screen bonanza that covers furnishings, appliances, food, medicine, behaviors, decorations, renovations, and much, much more. The touch-screen controls are easy to master and are tucked conveniently at the bottom of the screen. Furniture and other movable items are controlled by a handy drop down decorate bar where things will first appear when bought. 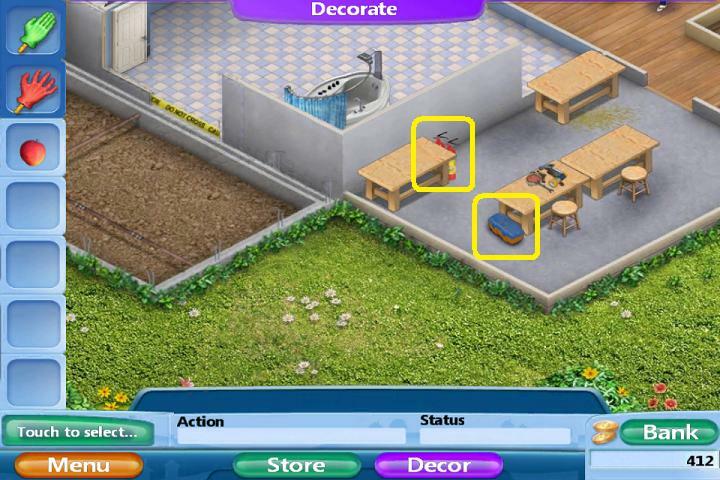 Items can be moved from the decorate cells to the house or vice versa for easy movement and storage. 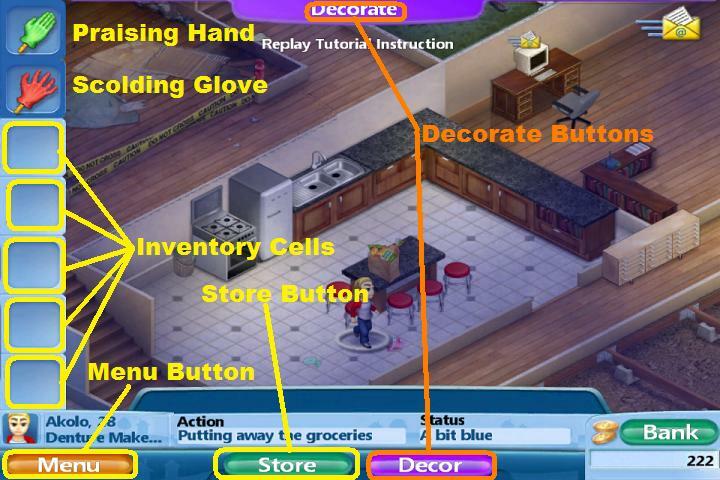 Items when first placed in the house have little arrows that allow for rotation to orient each item as needed. Last Day of Work also promises regular upgrades with new add-ons such as pets, new puzzles to solve, new storylines and events, and new items in the already massive store. Although the promise of the upgrades whets the appetite, there is already enough content to keep you busy for quite a while attempting to build your dynasty of simulated people. The game runs in real time which means events are happening even when the game is off (unless you've put the game into pause mode which freezes time). By overhauling the environmental aspect of the game Last Day of Work has taken an already successful formula and vastly improved the gameplay while keeping the entertainment of the first game intact. Be prepared for some major time suckage as you get caught up in the lives of your little sims and have fun directing their lives! Virtual Families 2: Our Dream House Walkthrough now available! The walkthrough will be broken into several sections: a general overview which includes sections on the controls; a strategy section; a puzzle section; a breakdown section covering things like careers, collectibles, trophies, etc. ; and a FAQ section for frequently asked questions. Due to the fact that upgrades are promised on a regular basis, the walkthrough will be added to as needed to cover the new topics. Right now there are very few "puzzles" in the game; however, more will come with the upgrades. The career salaries chart from the first Virtual Families will be included in this guide, and will be added to as information becomes available. The number and type of trophies available to win in the game may change as more features are added. Many items including career upgrades, house upgrades, furniture, and appliances are generation locked. This means that they cannot be purchased until your family has reached that particular generation. See the Store section later in this portion of the walkthrough for more details. As new sections (like pets) are added to the game, new sections will be added to the walkthrough. Pick your people carefully! At the beginning of the game you will pick the founder of your dynasty. Be very careful about checking their personality, especially their likes and dislikes. A person who dislikes knives will probably not do well if their career involves a kitchen, and a person who dislikes work will not do well in ANY profession. If a person really doesn't want children, they will be difficult to persuade to create the next generation, and without children your family may die out. 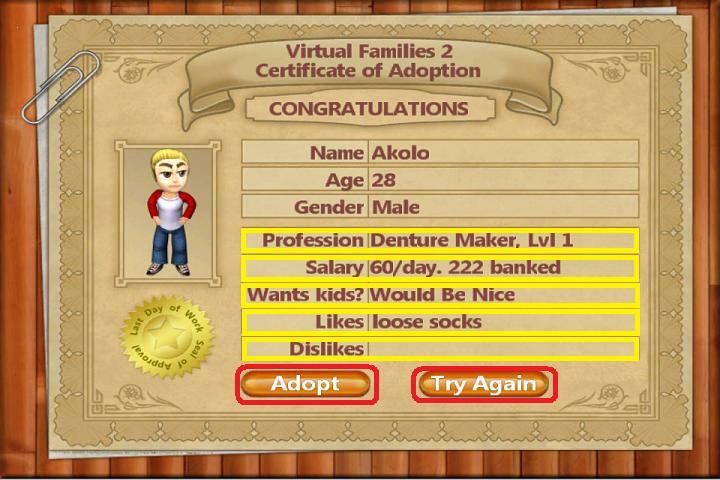 Here's a screenshot showing the adoption screen and the location of the personality quirks of your new family member. Learn the Controls! 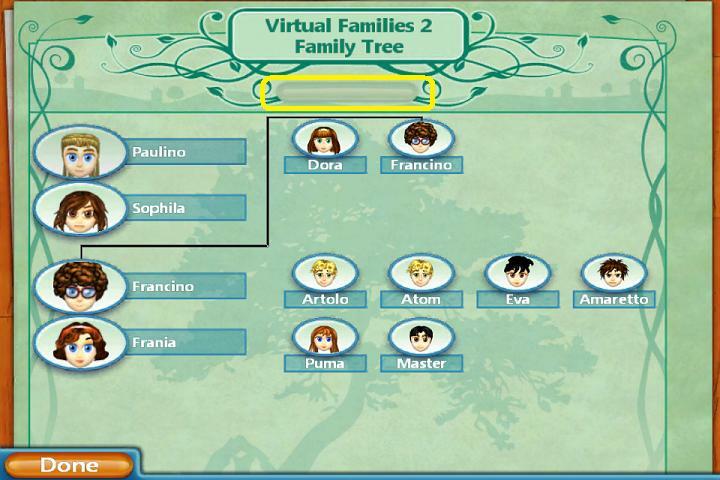 The controls in Virtual Families 2 are along the left and bottom of the screen, with the decorate pull-down inventory hidden at the top. The cells on the left below the praising hand/scolding glove will hold items bought in the grocery store, medicine, and odds and ends bought at the flea market. 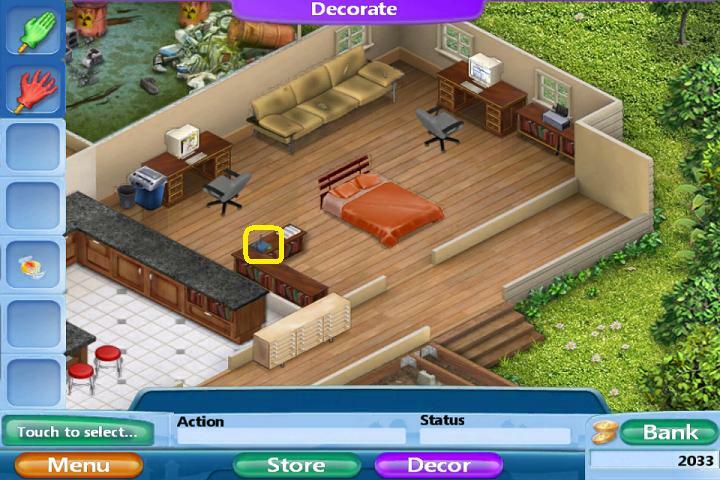 Furniture and other items for decorating the house will appear in the decorate pull-down menu. Career improvements for the office, workshop, and kitchen will appear on the screen when purchased. A more detailed breakdown of the store button will appear in the Store section of the walkthrough. Here's a screenshot of the basic controls. The menu button is your friend! Many important controls and information are in the menu. Here's a screenshot of the menu pull up screen. See the Menu section for a more detailed discussion of the items within the menu screen. Spend your money carefully! Money can be tight, especially in the early portions of the game. Money is needed to buy food and medicine to keep your little people alive and healthy, so make sure you don't spend every penny you have for something frivolous like decorations. Keep one or two hundred dollars in reserve to buy food at all times: there are events that can wipe out all the food in the house and will necessitate buying new groceries immediately. If a person suddenly falls ill, you may also need to purchase medical care. Earn trophies as fast as you can! Each trophy earned is another 25 coins in the bank, so definitely make an effort to get the ones that can easily be earned. See the Breakdown (Part 4) section of the walkthrough for a discussion on the trophies and how they can be earned. Do the tutorial! For those who are familiar with the first game this may be a little boring, but every tutorial instruction you complete means another 25 coins in the bank as a reward, so it is worth it to go through the whole thing step-by-step to earn that extra money. Collect ruthlessly! There are three types of collectibles in the game: botanical (leaves and twigs), entomological (bugs! ), and archeological (fossils). Once you've found a collectible, any additional ones of the same type can be sold on-line for money. See the Breakdown (Part 4) section of the walkthrough for a thorough discussion of the collectibles. Train your people well! Encourage good behavior, and punish bad behavior, by using the praising hand/scolding glove and the candy treats that are available in the flea market. Adults who work hard will earn more money which can be used to buy more interesting gadgets. Bad behavior in children can actually disrupt the adults at work and will interfere with income. There are also trophies for praising or scolding for certain behaviors. Don't forget to check in with your family! Time still passes even when the game is off, and it is possible to come back to a family that is starving and sick if you leave them alone too long. There is a pause feature in the menu which will freeze time if you know you are going to be away for a day or more. Keep your little people occupied! Although you need the adults to work and earn money, they do need leisure and down time or else they will not be happy campers. Cheap entertainment is available in the form of a classic TV (check the appliances section of the store) and will make everyone happy. Inexpensive toys like the hippo or the teddy bear will keep smaller children occupied and out of mischief. Happy families are usually healthier and live longer. The weather is your friend! Rain can be gloomy, but the bug collectibles come out more when it is raining, which can be money in the bank. Rain, snow, and fog can occur naturally or can be induced with special items bought in the flea market. Watch where your people go! Clues to puzzles can be determined by watching what your little people do when they are not working. Certain trophies can only be won when behaviors are exhibited that cannot be induced but which your family will do when they are unoccupied. The menu controls cover the bulk of the game and allow access to settings, the store, trophies, collectibles, and much more. Here's a screenshot of the main menu controls. The settings button is very important for the background elements of the game. Here you can set the volume of the sounds and music, pause time in the game, and reverse the day/night cycle (see the discussion in the Strategy Guide [section 2] of the walkthrough for details about the day/night cycle). 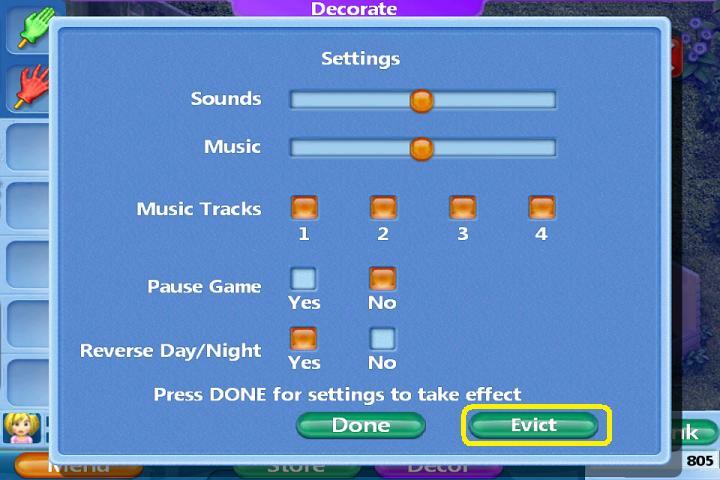 A very important button is found at the very bottom of the screen, the "evict" button, which will evict your current family and allow you to start over. Here's a screenshot of the settings controls. The Goals button: This is where you find the trophies you can win while playing the game. The trophies break down into two types, a single event or a cumulative event. Single events are trophies won for a single action, such as praising a behavior or solving a puzzle. Cumulative event trophies are earned for things that take time, such as picking up 10 wrappers, or earning 1,000 coins. Cumulative event trophies will have a progress bar showing how close you are to winning that trophy. Remember, each trophy earned can win 25 coins (or more), so it is important to get them quickly. A more in-depth discussion of trophies and how to earn them will be in the Breakdown (Part 4) section of the walkthrough. Here's a screenshot of the trophies screen. 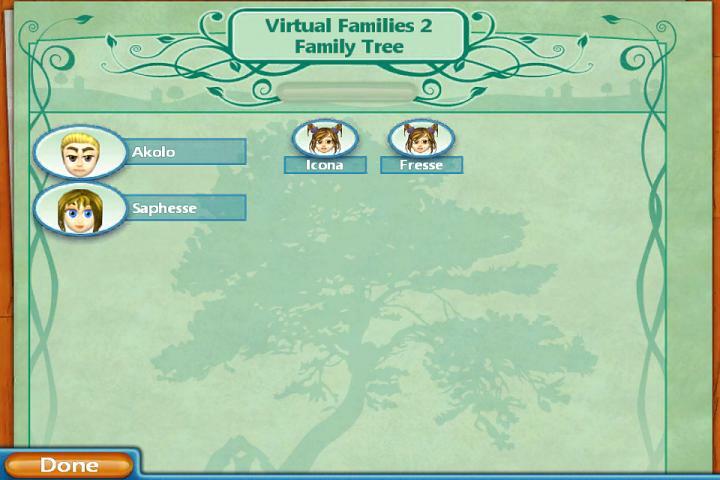 The family button on the menu screen will take you to the genealogy of your family. In the beginning it will show just your starting character. As the family grows it will add the spouse, then children, then the next generation as your first generation passes away. As long as your family keeps going, the family tree will keep growing. Here's a screenshot of the family tree. The buy coins button on the menu screen is where you can spend real money in the app store to buy coins and other items for the game. They range from 5,000 coins for $.99 to a massive 2,000,000 coins for $99.99. In this section are also four extras that are available for purchase: (1) a brokerage account which will increase the interest rate you earn on your coins; (2) a food club which will automatically deliver groceries to your family and give you a discount on groceries in the store; (3) a health plan that will give you a permanent discount on all medical items purchased in the store; and (4) a lucky rock which will increase the rate and rarity of collectibles that appear in the yard. Here's a screenshot of the buy coins screen. The help screen is a mini-tutorial on the basics of running your family and your house. For those who are unfamiliar with the virtual families or virtual villagers games, it can be very helpful with basics like moving around, using the controls, feeding your family, etc. At the end of the section are the credits for the design of the game. Here's a screenshot of the help screen. 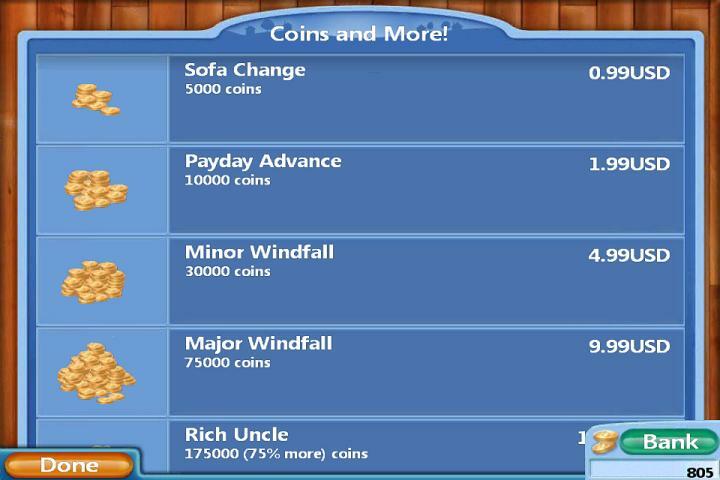 The upgrades screen are items that can be purchased for in-game coins (not real money) that can enhance the game. These items include: (1) roll the dice, which causes an event to instantly happen (as opposed to waiting for it to randomly occur); (2) Lobbying, which is not yet available; (3) Time warp, which will move time forward three years; (4) Adoption services, which can be vital for a family that cannot produce children and who haven't encountered a random adoption event; (5) On call maid service, which is a maid who shows up when you open the game and cleans the house for you; (6) On call gardening service, which is a gardener who shows up and pulls weeds in the yard; and (7) Lotto ticket, where you can purchase a lottery ticket (there is a trophy for winning the lottery). Note: At this point it may be a bug, but when the maid cleans or when the gardener pulls weeds, the numbers do not accumulate in the socks/wrappers/weeds cumulative trophies. Until this bug is fixed, don't purchase these services until you have won all of the trophies in this area or you will not be able to. Here's a screenshot of the upgrades screen. The store button is an alternative way to open up the store menu (there is also a store button on the main screen). The store menus will be discussed in the Store section of the walkthrough. The collections button will take you to the screens that hold your collections. 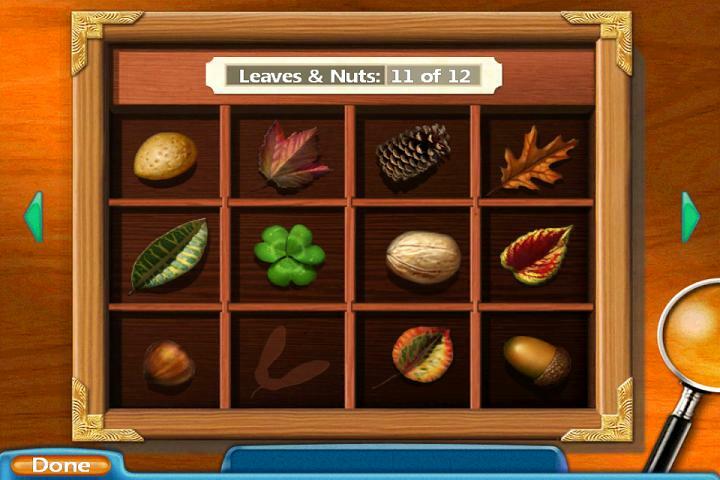 There are three collections: botanical (twigs, leaves, and seeds), bugs, and fossils. Although the botanical and bugs collectibles can be picked up from the beginning, the fossils require a certain event and cannot be collected until that happens. For a more thorough discussion of collectibles and what they are worth, see the Breakdown (Part 4) section of the walkthrough. 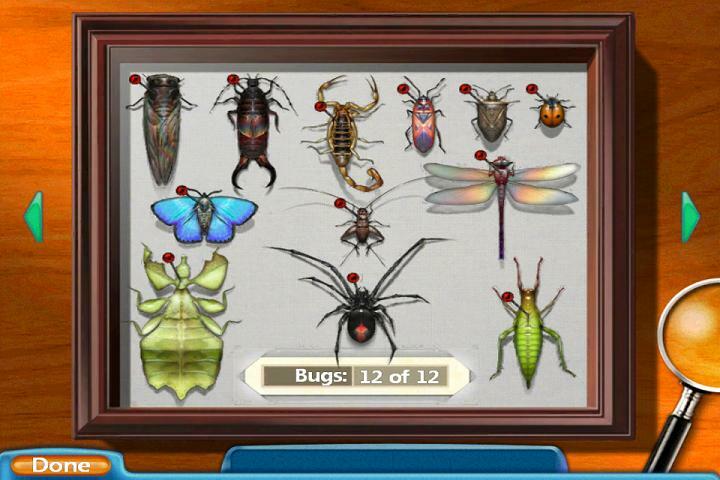 Here's a screenshot of the completed bug collection and a screenshot of the completed botanical collection. Many items in the store will have a "generation lock" on them. This means that these items may not be purchased until your family has reached that generation living in the house. There are locks through the fifth generation but no further (so far); this may change when the game upgrades. 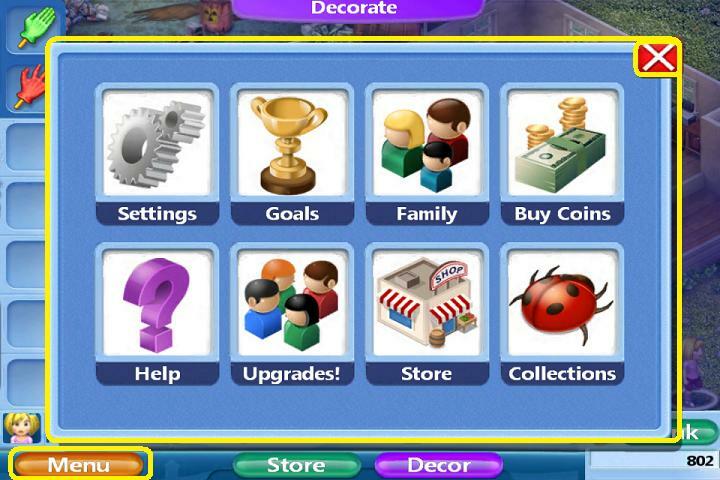 Unlike the first Virtual Families game, the store holds a multitude of items for purchase with a promise of more to come. 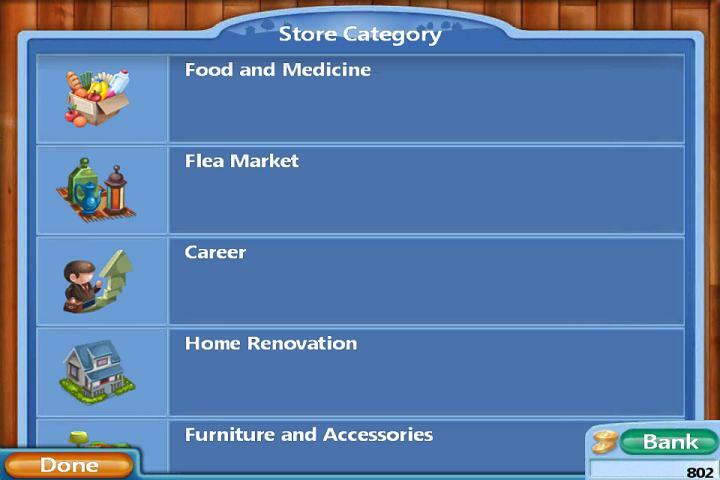 The items available are broken down into categories: (1) Food and Medicine; (2) Flea Market; (3) Career; (4) Home Renovation; (5) Furniture and Accessories; (6) Clothing; (7) Special Upgrades; (8) Coins and More; and (9) Pets. Here's a screenshot of the main store screen. The store can be accessed by using the store button in the bottom of the screen or through the main menu screen. The first section of the store, Food and Medicine, includes items that are immediately (and permanently) available for purchase. This includes regular and organic groceries (grains, dairy, meat, and vegetables) and medical items such as throat lozenges, cough syrup, penicillin, etc. which are needed when your little people get sick. For a more thorough discussion of the food and medicines available see the Breakdown (Part 4) section of the walkthrough. The second section of the store, the Flea Market, is a wide variety of items which can be useful for enhancing your family's lives. These items include candies and fruits for praising (or punishing) the people; books and DVDs for entertainment; perfumes for celebrating anniversaries; anti-spam software for the computers; weather-changing potions; and much more. The Flea market only holds 5 items at a time, and those items change three times a day (roughly every 8 hours), so check back often. For a more thorough discussion of the flea market, see the Breakdown (Part 4) section of the walkthrough. 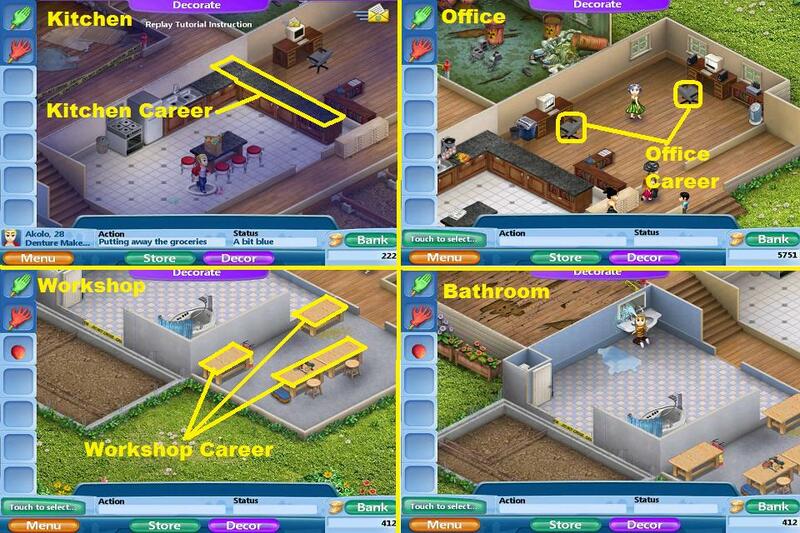 The third section deals with the "career" rooms of the house: the kitchen, the office, and the workshop. Each item available in this section enhances the work areas and makes career advancement go more quickly. There are 10 items for each career room, and most are generationally locked. 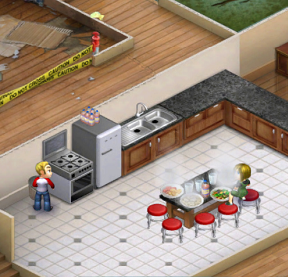 For instance, you can buy the first two kitchen enhancement items when you begin the game, the next two when the next generation is in the house, the next two when the third generation is there, etc., until the fifth generation, when all items will be unlocked. Remember to only buy the career upgrades that are needed for your particular family members, don't waste money on kitchen upgrades when your little people only work in the office. There is one exception: The starter tool box for the workshop. Buy this immediately, as you will need it to repair household items like broken sinks and clogged toilets. A more thorough discussion of the career items can be found in the Strategy Guide (Part 2) of the walkthrough. The fourth section, Home Renovation, deals with cleaning up and renovating the unused (and contaminated) rooms of the house. Two items are available in the first generation, the west room (the one with the bug infestation) and the first bedroom (the one with the toxic chemicals). 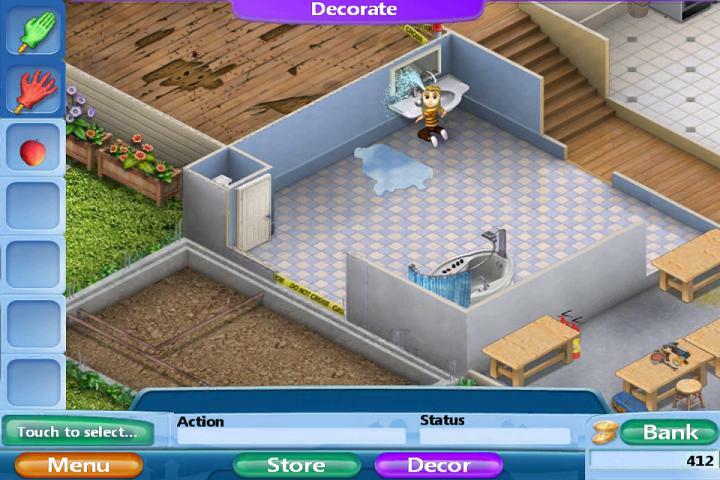 You can purchase the upgrades, although the ability to clean these rooms without spending money may be future puzzles. In the second generation you can expand the front and back porches; in the third generation you can build the auxiliary room to the left of the bathroom and that central room above the kitchen; in the fourth generation you can build the second bedroom and second bathroom (the foundations at the upper right of the house); and in the fifth generation you can renovate the small and large rooms (water and fire damaged) at the top of the house. The fifth section, furniture and accessories, contains a wide variety of items for the house including beds, couches, appliances, toys, decorations, and other items which you can use to decorate the house. Inside the section is also an "on sale" section, which changes items three times a day (every 8 hours). Check the sale section to find bargains on items you might need. Many items are generationally locked, so check the sub menus and look for little lock icons with a number on them. This shows which generation needs to be in the house for the item to be available. Also available in this section are outdoor items like barbecues, swimming pools, and the like to decorate the yard. The sixth section, clothing, contains a small variety of clothing for your male and female family members. Some of these items are also generationally locked, and the items will change eventually. The seventh section, special upgrades, is the same section that can be found in the main menu screen. The eighth section, coins and more, is the app store purchase section covered in the main menu screen. The ninth section, pets, is not yet available but will come with game upgrades. When the game begins your first decision is to pick your starting family member. This first pick can affect the game down the road, so pick carefully. Try to get someone who is younger, 25 or less if you can manage it. This will give you a lot of time with your first family, as the little people do age and die as time goes on. Favor someone who has more money in the bank, you're going to need the initial cash. Also check their occupation against our Careers and Salaries spreadsheet to see which career will pay off in the long run. The more money they make, the sooner you can buy upgrades and other necessities. As a side note, this spreadsheet is a work in progress, so feel free to post any new jobs or salaries in the comments section so that the chart can be updated. Having money and a good career path is good, but don't decide until you have thoroughly checked out the likes and dislikes of the person's adoption sheet. Someone who dislikes work is not going to earn much money no matter how good the career. And try to find someone who is at least indifferent to having children. This makes it easier to produce the next generation. Here's a screenshot of the adoption screen. Choose wisely young padawan. Another decision should be made at this point, whether to play with the day/night schedule to match the real world or in reverse. Playing with your people at night when it is night for them can lead to problems because they need sleep to stay healthy and active during the day. If you will only be playing at night it would be good to reverse the game so that night for you is day in the game and vice versa. Once you've chosen your little person, they will enter the house and begin to look around. Simply touch and drag the screen to also look over the house and grounds. You will find four functional rooms: the office, the kitchen, the workshop, and the bathroom. The first three rooms will be for your person's career, the bathroom is self-evident. Do go through the tutorial and follow the directions. For every tutorial order you complete, you get another 25 coins, which adds up. When the tutorial gets to the part about choosing a spouse, don't necessarily pick the first one that comes along. Check the money, the career, and the likes and dislikes. Most importantly, try to find a spouse who will use the same room in the house for their career as your initial character. In other words, if your first character has a job that uses the office, choose a spouse with a job that will also use the office. Most careers are obvious with which room in the house is necessary for their job. Anything to do with cooking, food, or drinks is usually the kitchen. Anything that has to do with manufacture is the workshop. Anything that requires a computer will do their job in the office. If you've lucked out with the first spouse and finished the tutorial, you should now have a woman running around carrying a baby. Women who are nursing will putter around the house, will pick up trash, socks, and collectibles, and will do other things like make meals. They will NOT, however, work until the baby is 2 years old, so don't worry about training her on her career. Following the tutorial you should also have delivered one bag of groceries to your little people. This will not hold them for long. Go to the store (the food and medicine section) and buy regular groceries from each food group, grains, meat, dairy, and vegetables, then set the groceries on the table. This will get you a trophy and 25 more coins, as well as stock up the house to last a day or so. Once the groceries are put away you can start training your little guy in his job. Drop the person on his workspace and once he starts working on his career use the praising hand once (you should already have used it during the tutorial as well). Here's a screenshot of the working areas of the house, the highlighted spots are where you drop your person to work. In the kitchen it is the right counter. In the office it is the office chairs. In the workshop it is any of the workbenches. WARNING: Do not use the praising hand more than twice for the same task in 24 hours or your little people will consider you a nag and run away. If you feel you need more reinforcement for good behavior, you can buy candy and fruit in the flea market which you can also use to praise. When using candy, make sure it is "good" candy like licorice or cinnamon. Salty candy and dirty candy are used as negative reinforcement, like the scolding glove. Once your little guy is working, you can use the nursing mother to clean up the house. Tap and hold to pick her up, then drag and drop her on any wrappers or socks in the house. Wait for her to deposit the wrappers in the trash or the sock in the bathroom, then drag and drop again until all the debris is cleaned up. This debris will only be in the livable areas of the house and the hallways. Do not drop your little person in the rooms that are blocked off with tape, they will simply run away. Once the house is clean inside, you can use the mother to pull any weeds outside as well. Here's a screenshot of some house debris. Note that weeds are very difficult to spot at night. Once the house is clean (and you get the trophies for that), you can drag and drop the mom around to investigate other areas of the house. Drop her on the kitchen table for instance and she will set about creating a meal. Drop her in the shower if she is not feeling fresh, and praise her for taking a shower which will ensure that she will continue to do so when she needs to. You should have also placed the couch during the tutorial, but you can use this time to experiment with where you would like it to go. It can go in the office along the back wall, or even on the finished section of the front porch. If you have enough money then immediately go to the career section of the store and scroll down to find the tool box, which is for the workshop career. Buy the toolbox as soon as possible even if your little person is not using the workshop. House breakdowns such as leaking sinks and backed-up toilets can only be fixed if you have the toolbox in the workshop. Take the time to scroll around the outside and look for collectibles to show up. Collectibles can be bugs of different types or leaves and twigs. Again, use the nursing mother to pick these up. Also take the time to check out the bank button in the lower right of the screen. Below the button is the amount of money you currently have. Tap on the button to see the future prospects based on your little people's salary and interest earned. 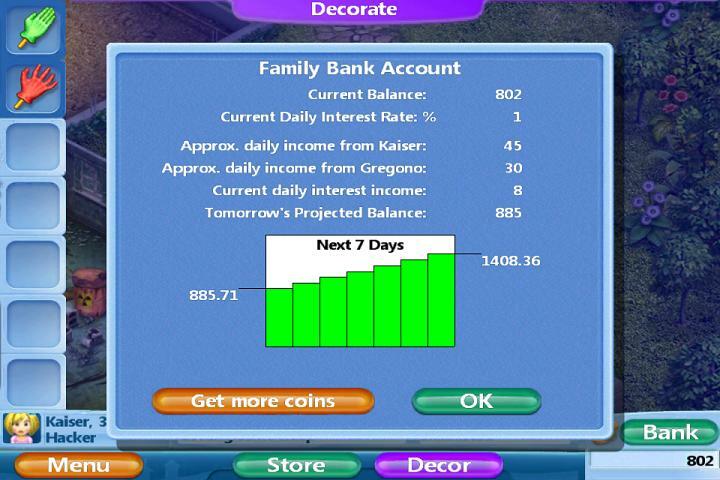 Here's a screenshot of the bank screen. NOTE: This is just a projection based on their current job level. As they work and progress to higher levels, their salaries will increase proportionately. Choose someone with a large bank account, a job that will earn lots of money, or both if possible. Earning money quickly in the beginning is very helpful. Do go through the entire tutorial. For every tutorial command you complete you earn another 25 coins. Go through the trophies and try to achieve the ones that are possible, like the one for buying all four food groups in the store. Each trophy achieved is another 25 coins. Look for collectibles. New collectibles go into the low cabinet in the hallway between the kitchen and the office. Once you have a collectible, if another one shows up your people can sell it on the internet for money. Collectibles are a great way to earn money quickly. Use non-working folks to collect, like nursing mothers or children. Don't interrupt your adults if they are working. The only way they gain experience (and higher salaries) is if they complete a work cycle. Don't over praise. Using the praising glove more than twice in 24 hours for a particular task will make your little person run away. If you have the money use the items in the flea market like candy and fruit for this purpose instead. Try to get the woman pregnant during the night cycle. This way she will not lose much work time as the adults will not work at night. By day time the child should be running around and she can go back to work. Most of your time with the first generation will be keeping them fed, keeping them healthy, and earning money. When you enter the game, watch your little people carefully. If they are moving more slowly than usual, they may be sick. Tap on your little person and check their status in the lower right of the screen. You want to see a mood, such as happy, or elated, or even "a little bit blue". If you see "a little bit ill" you want to take care of the illness immediately. If a person is ill, just pick them up and drop them in an open space, like the hallway. Drop them enough times and they will tell you their symptoms. The first illness you are likely to encounter is hiccups, which can be cured by dropping them on the bathroom or kitchen sink for a drink of water. A more thorough discussion of illnesses and their treatments will be in Breakdown section (Part 4) of the walkthrough. Your little people will feed themselves, but you can always use an adult (or a child over the age of 14) to make a meal by dropping them on the kitchen table. Once the meal is made, drop all of the family members on it and they will eat until they are full. This helps keep everyone healthy and happy. Once you have kids keep an eye on them. Bad behavior such as flipping the light switch, banging pots and pans, or ripping books can disrupt your adults at work. Use the scolding glove (or bad candy) to immediately correct disruptive behavior in your kids. As a bonus, this will earn you a couple of trophies and more money. Do try to buy the first two career upgrades in the store when you can afford to. A career upgrade (a new item for their workspace) makes them earn money faster and progress in their career more quickly. When you have a little extra money, buy a few cheap entertaining items in the store. Check the "sale" section of the furniture store for the TV, or buy an inexpensive toy for the child. This will keep your family happy with a minimum of money spent. Don't waste money on a bed until you have a room to put it in. 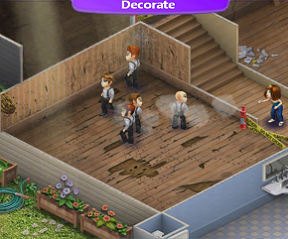 You can also try to solve some of the puzzles in the game, like watering the flower boxes. See the Puzzles (Part 3) section of the Walkthrough for details. If you've accumulated enough money you can get the cheapest home renovation, the west room (the one infested with insects), which is only 650 coins. Hold off on this, though, until you've been able to afford the career upgrades first which are more important in the long run. Your family can sleep on the couch for quite a while without getting depressed if you keep them fed and buy a few cheap entertainment items. Check the flea market frequently as the items there change three times a day. Important items to look for are career magazines which usually cost 300 coins, but can quickly advance your little person in their career. Don't buy a kitchen career magazine for someone who doesn't work in the kitchen. Match the magazine to their skill, otherwise you are wasting money. Another thing to keep an eye out for in the flea market is a rock-hunter certificate. This is rather expensive at 1,500 coins, but it will enable you to pick up the third type of collectible, the fossils. Don't spend all your money on an item, make sure that you have a couple hundred coins in reserve. There are events that can wipe out all the food in the house and you might need the money to replace it quickly. One of your little people might also get sick and you will need the money to cure them. Most household repairs can be taken care of with the tool box, but an oven fire can only be put out with an extinguisher. Your workshop has extinguishers near the left bench. Drop a person on them to put out any oven fires. You usually see these fires in the first generation. Don't forget to praise whoever is putting out the fire, you'll get a trophy. Your little folks will continue to age with the game. When children pass the age of 14 you can use them for tasks like making a meal. Once the kids hit the age of 19 they will disappear off to college. Once they're gone you won't see them again until it becomes time to pass on the house to the next generation. When your little people get past the age of 55 they will officially be elderly and will slow down in their movements. They are not necessarily ill, just old. Depending on the food you feed them and the condition of the house, your little people will die sometime after the age of 60. Once one of the adults passes on it will trigger the next generation screen. You do not have to immediately move to the next generation if the other adult is still alive, you can wait and do it later. Here's a screenshot of the family tree. There is a small button at the top, nearly invisible, which becomes visible when it is time to move to the next generation. When it is time to pick the second generation, choose wisely. Hopefully one of the children will have a career that uses the same room you've already put upgrades in. Once the second generation moves in, look for e-mails alerting for marriage proposals. You can be more picky this time around and try to find a mate who has a good career, wants kids, and will work in the same room you have been upgrading. Don't wait too long, though, for a perfect marriage proposal. The older your person gets, the less frequent the proposals, and it is still cheaper to produce children the natural way. There is an adoption service, but it costs 4,000 coins. An adoption may happen as a random event, but it is impossible to predict if it will happen or not. If you want the game to continue, you must have at least one child in each generation. By this point you should have enough money to feed your little folks organic instead of regular groceries. The best way to feed them is buy one from each food group all at once and put the groceries on the table. This is enough food to last a day or two and will keep them happy. They are also healthier if fed organic groceries. 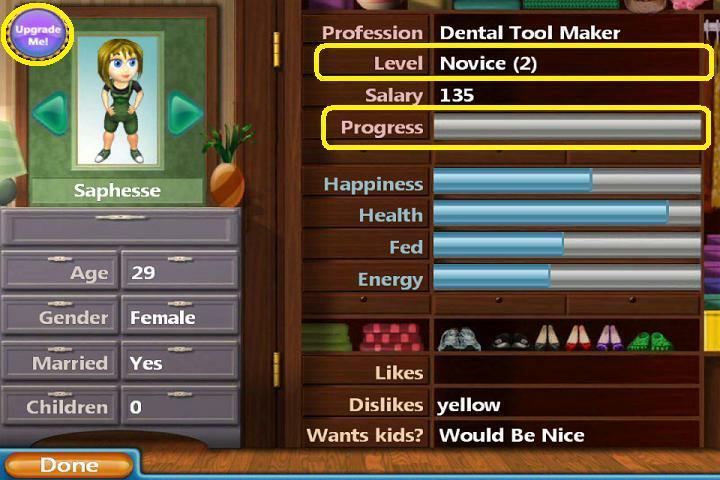 If you can afford it buy the next two career upgrades available, this will increase the earning power of your little people. Keep the spending on decorating to a minimum, you want to accumulate money, the more you have in the bank the more interest you will earn. At this point you should, though, at least renovate the cheapest bedroom and buy a bed or two to keep the little folks happy. Check the sales in the furniture store for cheap items like posters to increase happiness for very little cost. Continue to pick children with careers that use the same room you are upgrading, and continue to buy the career upgrades. You can also spend money on a few frivolities like fixing up some of the cheaper rooms and buying furniture, decorations, and appliances that are not too expensive. Most of your money should go towards the career room, however. A career room with all ten improvements will produce an adult that can reach the pinnacle of their earning power in their 40s or earlier, increasing the income. At this point you may start earning some of the cumulative trophies, like the ones for wrappers or dirt smudges. However, you will not earn points for socks picked up until you can buy a washing machine, which doesn't unlock until the third generation. For a more thorough discussion of the sock trophy see the Breakdown (Part 4) section of the walkthrough. By this point you should have plenty of money which you can now apply to really fixing up the house or upgrading different career rooms. Check the trophies section, there are trophies for buying certain things like the fish tank, art, the pinball machine, etc. At this point you should have the money and the items may be unlocked. Enjoy decorating and redecorating, and watching your little people interact with their new stuff. Have fun exploring what they will do when dropped on new items in the home like the piano or the playhouse. The game is open-ended and can go on forever as long as each generation produces at least one child. The developer has promised upgrades that will include new items for the house, new things like pets, and new puzzles to solve. Enjoy! Most actions in the game are pretty obvious as are the trophies that can be earned. You earn the sock trophy for picking up socks, for instance. However, some trophies are for things that are puzzles, actions that need to be thought out or solved. There are not many puzzles in the game at the present time, but the developer has promised more with the game upgrades. New puzzles will be added to the walkthrough as they are discovered. For instance you are supposed to be able to upgrade certain rooms in the house not by paying for it but by solving a puzzle, although these puzzles do not seem to exist at this time. There are flower boxes on the left side of the house near a hose and a rack of watering cans. There is also a trophy for watering these boxes, but dropping your little person on them just causes confusion. The trick is to use the whole family, adults and children. Start dropping your little people on the rack of watering cans, one at a time. They will fill a can at the hose and run off to water various flowers in the garden, like the roses in the front yard. Once they've finished, drop them on the watering cans again and watch them water the plants. Keep this cycle up and eventually one of them will water the boxes. When they water the boxes you will win the trophy. 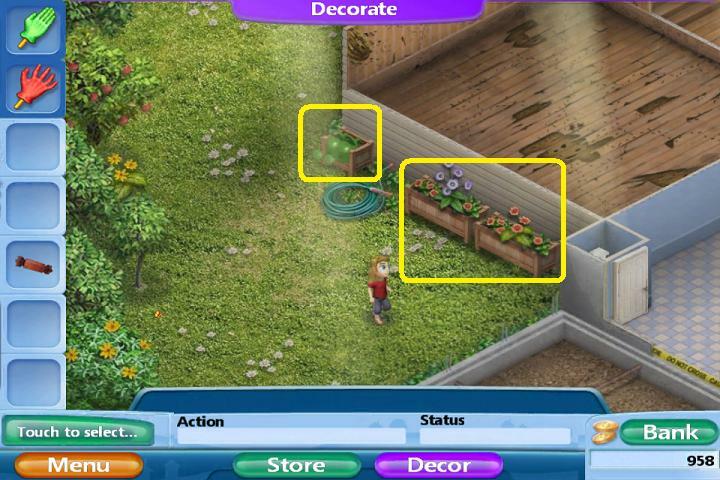 Here's a screenshot of the watering cans and the flower boxes. This is technically not a puzzle, but in order to fill this collection you need to follow several steps. You will notice that mounds of dirt will appear in the yard, just like the botanical and bug collectibles. When you drop one of your family on the mound, however, they will be confused and will not know what to do. You have to have knowledge in order to collect these fossils. This knowledge is obtained with a rock-hound certificate that is available in the flea market. Since the flea market items are random, it may take some time for this item to show up. And it is expensive, costing 1,500 coins, so you may not be able to buy it at first. Once you have the certificate, drop one of your family on a mound and they will dig out part of the fossil. You collect the pieces of the fossil like the other collectibles, new pieces go in the cabinet, duplicates will be sold on-line. When the fossil is complete you will have a lovely (and expensive) dinosaur skeleton in your collections. You may notice a conga line of ants in your kitchen, going from the table to the refrigerator/trash area. Your little folks will notice this as well and start stomping on the ants. Praise them for that, it's a trophy. A mysterious object will also appear on the kitchen counter to the right of the sink, it is a big pile of cinnamon. You will need this to get rid of the ants. screenshot. Drop a handy person on the cinnamon ball, it can be an adult or a child. The person will then take the item into the workshop and create a "cinnamon ingredient". Once they are done they will walk away. At the same time, an orange object will appear beneath the trash can outside. screenshot. Once the cinnamon ingredient has been prepared, drop someone (adult or child) on the orange thing, and they will take it into the workshop and complete the ant spray. They will then go into the kitchen and spray the toxic stuff until the ants are gone. Once the ants are gone you will win a trophy. Things break down, especially in this household. Here's a screenshot of the bathroom sink going kablooey. The only way to repair these items is to have the blue tool box in the workshop. The tool box is a career upgrade for that room, but you should buy it even if your little person doesn't work in the workshop. Drop a person on the toolbox and they will fix the sink/shower/toilet/whatever is broken. Here's a screenshot of the toolbox. 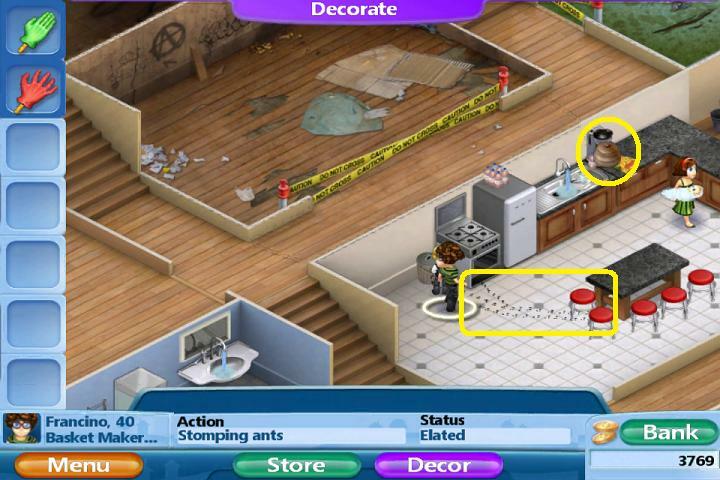 The above screenshot also shows the location of the fire extinguishers, which need to be used in case of an oven fire. Sometimes when you send your person to work in the office they can't due to computer failure. Drop an adult on the computers. If the problem is the computer they will fix it. If neither computer is the problem and you get the message that there is no internet, then the router needs to be fixed. The router is on the low bookcase in the lower left of the office. Here's a screenshot showing the location. Drop an adult (or a child over 14) on the router and they will fix it. This section covers the details of the games, including collectibles, careers, trophies, medicine, etc. As new information becomes available or upgrades appear this walkthrough will be updated. Want to know how much a collectible can sell for, or how much a chewing gum designer can make? This is the place for answers. There are three types of collectibles in the game, botanicals, bugs, and fossils. Each type of collectibles has three types: common, uncommon, and rare. The type tells you how often they show up. Common collectibles can be found all the time, uncommon show up every now and then, and rare collectibles show up, well, rarely. When a collectible appears drop any family member on it and they will bring it to the house. If the collectible is one that you do not have, they will take it to the collectible cabinet in the hall between the kitchen and the office. If the collectible is one that you already have, they will sell it on the internet. Prices for collectibles depend upon the type. Common collectibles will sell for 5 coins, uncommon collectibles will sell for 15 coins, and rare collectibles will sell for 50 coins. The botanical collectibles usually show up in the back and side yards. They show up any time of day or night and in any weather condition. The bug collectibles show up all around the house, and tend to show up in the rain and at night, making them much harder to spot, especially on the small screen of an iPhone. Fossil collectibles are a special case and cannot be collected immediately. In order to collect them you must have purchased a rock-hunter certificate in the flea market, which costs 1,500 coins. Once you have the certificate you can collect fossils just like the other collectibles. Collectibles are a great way to bring in extra money, especially in the early portion of the game. Use children and nursing mothers to pick them up in order to not disturb a working adult. There is a "lucky stone" available for purchase in the app store section. The stone costs $0.99 and causes collectibles to show up at a greater rate, especially the rare ones. There are trophies for completing each collection, a trophy for completing all of the collections, and multiple trophies for selling collectibles. See the Trophy section of the walkthrough for details. We identified over 100 careers in the first Virtual Families game, they can be found in our Careers and Salaries spreadsheet. Many of these careers are in the new game along with some new ones. As careers are identified they will be added to the spreadsheet. If you spot a career or salary that is not on the spreadsheet please post in the comments section and we will update as needed. Starting salary is not necessarily an indicator of the top salary of a position. A career that starts at 60 coins a day may finish with a top salary of 285 coins a day, whereas a job that starts at 15 coins a day can finish at a salary of 690 a day. When in doubt check the spreadsheet. Try to go for people who will end up earning more money. Every time one of your adults completes a work cycle they earn money as well as job experience. If you look at the personal statistics screen you can see what level they are on (they start at level 1 and hopefully finish at level 8), what they are earning, and how close they are to a promotion to the next level. 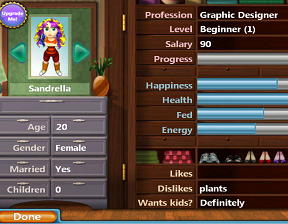 Here's a screenshot of the personal statistics screen. Each time a person moves up a career level they earn more money. Each level takes more work cycles than the previous to move to the next. There are ways to quickly advance levels. One is a career magazine that will move the experience bar up. These magazines are occasionally available in the flea market. There is also an event where a child will show up at the door selling the magazines for a discount. Remember to purchase a magazine that suits the career field your person is working in. An office worker magazine is useless to someone who works in the kitchen or workshop. Random events and random e-mail events can also affect career progress. There is an e-mail event which furthers a person's career, there is also one which removes any progress they've achieved on a level. These are random things and cannot be predicted. Quick career achievement can also be found in the personal upgrades. See the personal upgrades section for more details. There are currently 93 trophies that can be won in the game, and that number may change with new updates. Most trophies will earn 25 coins when they are won, there are a few that will earn more. Trophies are split into two groups, single event trophies and cumulative trophies. Single event trophies are won for a single thing happening, cumulative trophies are earned for multiples of an event or action. Cumulative trophies have progress bars which show how close you are to earning the trophy. For most trophies it is easy to see how they are earned, but some are tricky. This walkthrough will include all of the current trophies and how to get them. 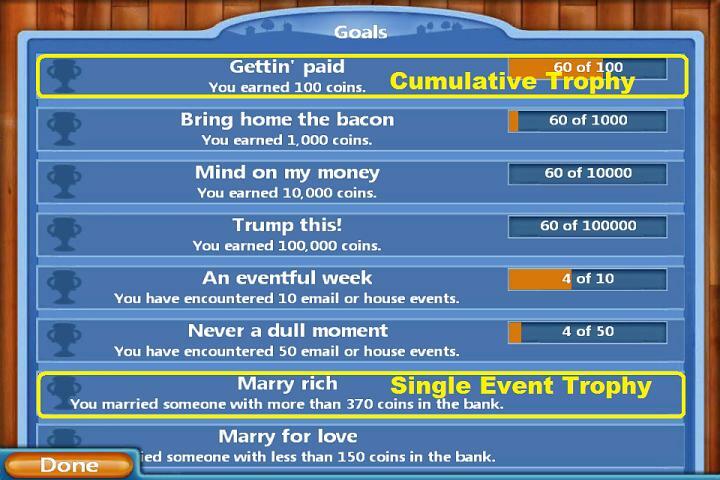 The Money Trophies: These trophies include "Gettin' paid", "Bring home the bacon", Mind on my money", and "Trump this!". They are earned for making 100 coins, 1,000 coins, 10,000 coins, and 100,000 coins respectively. "An eventful week" and "Never a dull moment" are cumulative trophies earned for living through e-mail or house events. The first is 10 events, the second is 50 events. There are three marriage trophies: "Marry rich" for marrying someone with more than 370 in the bank, "Marry for love" for marrying someone with less than 150 coins in the bank, and "A perfect match" for marrying someone with the same career. The third one is very difficult to get as there are over 100 careers available. There are five trophies for having kids: "Oh baby!" for having a baby, "Oh baby baby!" for having twins, "Ohhhhhhh dear" for having triplets, "Four is enough" for having 4 kids (not all at once), and "No vacancy" for having six kids. Six kids is the upper limit for each family, you won't be able to have any more, nor will you be able to adopt. Twins and triplets are random events, there is nothing you can do to make them happen. There are nine praising trophies (praising your little people for doing certain things) and two additional trophies for praising good behavior for all 9 trophies and for praising 100 times. Some of the praising trophies like "Need to weed", "Care and feeding", "Ants in my pants! ", and "Fire stopper" you can set the person to doing the task, then praise them for it. Others are random actions on the part of your little people and you just have to observe what they do and praise them if they are doing the right thing. This includes the doing kung-fu, star gazing, gopher chasing, reading the newspaper, and brushing their hair. Next are six food trophies. The first three, "sustenance", "abundance", and "gluttony", are earned for spending money on food for your family. "Preparedness", "It's not a pyramid but..." and "Nutrition snob" are earned by buying certain types of food for the family. Each of these trophies are pretty self-explanatory. "Ant Terminator" is the trophy you win for solving the ant puzzle. See Part 3 of the walkthrough (Puzzles) for more details. The next four trophies are for curing illnesses in your family. "A spoon full of sugar" is for curing ANY illness, "Not just a virus" is for curing something that requires penicillin (see the medical section for more details), "Gravely ill" is for curing something that requires a vancomycin shot (see the medical section for more details) and "Hic" is for curing someone of the hiccups, which simply requires dropping them on a sink for a drink of water. The next seven trophies are either for buying something for the house or completing a puzzle. Many of these items are generation locked, and can only be bought when that generation is occupying the house. The fish tank is unlocked in the second generation, the art in the fourth generation, the pool in the fifth generation, the pinball machine in the fourth generation, the radio in the second generation, and you can buy a basic barbecue grill in the first generation. The "Plant Tycoon" trophy is for solving the flower box puzzle (see Part 3 of the walkthrough for details). "Trick" is for giving 10 nasty pieces of candy to the kids as discipline (they can be purchased in the flea market), "Treat" is for praising with 10 pieces of nice candy (also available in the flea market). The next four trophies are for disciplining the kids with the punishment (red) glove. "No throwing" when they are throwing rocks, "No destroying" when they are tearing books, "No jumping on bed" when they are jumping on the bed, and "Tight ship" for winning the previous three trophies. Trust me, the kids are monsters and will exhibit all these behaviors and more within 10 minutes. The next batch of trophies are for career actions. "Movin' on up" is for getting a promotion, and the "Office overlord", "Cooking captain", and "Workshop warrior" is for your little person mastering a career in those fields. These are difficult to obtain at first because your people may not make it to the top of their fields until you have upgraded the work spaces, and that can take generations. "Building for the future", "The dream kitchen", "Office of the future", and "Workshop of wonders" are for upgrades to the career rooms. "Building for the future" is won with the first upgrade. The others will take quite some time, as the last items for completely upgrading the career rooms are not available for purchase until the fifth generation. "This old house" is a trophy that can only be earned when you have completely renovated the house, which is not possible until at least the fifth generation when the renovations are available. The last renovations are also expensive, so it may wait until you also have the money. "Handyman" is earned for fixing 10 household breakdowns like broken sinks, showers, and toilets. See the Puzzle section of the walkthrough for more details on how to accomplish repairs. "Sock collector", "The sock market", and "A perfect sock storm" are for collecting 10, 50, and 100 socks AND PUTTING THEM IN THE WASHING MACHINE. When you pick up socks in the first three generations of the game, your family will simply pile them in the bathroom. In the third generation the washing machine will be available for purchase, then you must keep dropping your family members on that pile until they have transferred all those socks into the machine. The numbers only register when they are in the washing machine. 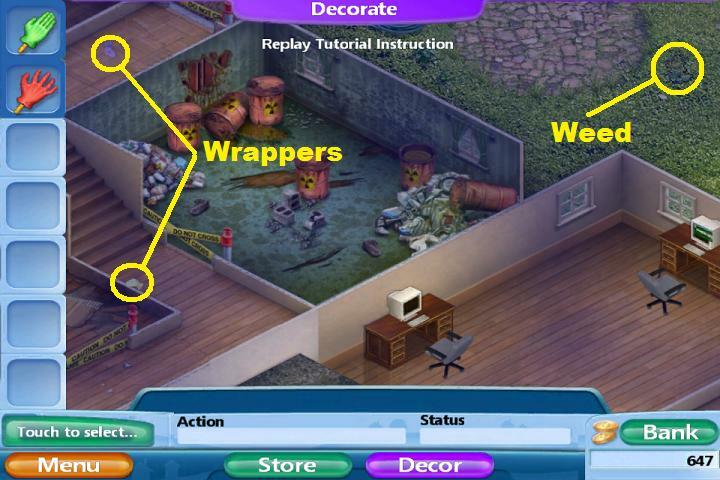 "Wrappers", "Wrap attack", and "The wrappers wrap-up" are for picking up 10, 50, and 100 wrappers and throwing them in the trash. "See spot? Run! ", "Spotty behavior", and "Sir spot-a-lot!" are for cleaning up 10, 50, and 100 dirt smudges on the floor. "Weed picker", "Weed whacker", and "Weed obliterator" are for pulling 10, 50, and 100 weeds in the yard. NOTE: At this point, if you hire the maid service or the gardening service, anything they pick up, pull, or clean does NOT register in the trophy section, so do not hire these services until you have won the trophies. "Spring Cleaning" is for cleaning the inside of the house, "Order in the yard" is for pulling every weed, and "A gleaming estate" is for doing both. These are easy trophies to get at the beginning of the game since the non-renovated rooms don't count. Next are the collectible trophies. "Botanist" is for completing the botanicals collection, "Entomologist" is for completing the bugs collection, and "Raptor hunter" is for completing the fossil collection. "Master collector" is for completing all three collections. "Recycler" is for selling 5 common collectibles on-line, "Super recycler" is for selling 15 common collectibles on-line. "Monetizer" is for selling 5 uncommon collectibles, "Super monetizer" is for selling 15 uncommon collectibles. "Super seller" is for selling 5 rare collectibles and "Super duper seller" is for selling 15 rare collectibles. "Goal collector" is for completing ALL of the collecting trophies. The next trophies are for one of your family members reaching the ages of 35, 45, 50, 60, and 65. Most of these are easy, but your people may not reach 65 until you are constantly buying them organic groceries and have added exercise equipment to the house. The last trophies are for winning other trophies, "Overachiever" for winning 10 trophies, "Unachievable" for winning 25 trophies, and "The impossible dream" for winning 50 trophies. When one of your little people is moving more slowly than usual they may be ill. Tap on them to highlight and check their status. If they are ill it is time to diagnose and treat. The easy (and cheap) way to diagnose an illness is to keep picking up and dropping an ill person in an empty space, like the hallway. After three or four drops they will tell you their symptoms. Based on the symptoms you may have to buy medicine in the store and administer it to the sick person. Hiccups can be cured by dropping a person on the nearest sink for a drink of water. A sore throat requires the purchase of throat lozenges, an upset stomach requires peptic syrup, a headache needs the analgesic/anti-inflammatory, a bad cough requires the antitussive syrup, itchy skin needs the cortisone cream, and sneezing needs the antihistamine. Sometimes your little person may be having an allergic reaction and need two medicines, both the cortisone cream and the antihistamine. If a person keeps falling ill, and you find yourself treating them four times or more within a couple of hours, they may have a more serious underlying infection. When this happens, you may need to purchase the doctor consultation. Use the doctor consultation on your person who keeps getting ill. It will tell you precisely what needs to be done. If the diagnosis requires penicillin, after you give them that you will win the "Not just a virus" trophy. If the diagnosis requires a vancomycin shot, you will win the "gravely ill" trophy. If a person with a serious underlying infection is not treated, they will continue to get sicker and weaker and can possibly die. The last item in the medicine section of the store is the baby boost. This can be used to help men and women who have trouble having a child. The shot will permanently increase their chances. Note: if the shot doesn't work the first time, don't keep using it, each use will decrease the chances of a pregnancy. The Flea Market section of the store is a bonanza of odd and useful items. The store holds five items, and it refreshes its inventory three times a day. What shows up is completely random. The store is a source of candy both good (peppermint, cinnamon, etc.) for praising children or adults and bad (salty, dirty) for punishing children. There are trophies to be won for using both types of candy. Occasionally you will find perfect fruit like bananas and mangoes in the flea market. These items are healthy and nutritious for your little people, and are perfect to use for praising when you don't want to overuse the praising glove. The fruit is also good to give family members who are weak and recovering from a serious illness. Two types of drinks can show up in the market, chamomile drinks to induce sleep (they take away energy levels) and energy drinks to boost energy (useful if one of your little people did not get enough sleep the night before and keeps taking naps). Vitamins can sometimes be found in the store. These are good for people recovering from a serious illness who are weak. Books: various children's books will pop up from time to time. Purchase the book and give to an adult and they will read to the children. DVDs: various DVDs will show up as well. Give to an adult and they will pop it into the TV so the family can have a movie night. Note: the DVD is useless if you haven't yet purchased a TV. Anti-spam software: can be used on the computer to stop the spam e-mail events which are annoying. Weed bomb: can be used on the yard to eliminate all weeds. When this is used you won't get credit for weeds pulled, but it can be useful to get the clean yard trophy if you cannot spot a hard to find weed. Cologne/perfume: can be used on a man or a woman. Use this and watch the adults celebrate their marriage. Professional magazines can be purchased (usually for 300 coins) which can help your adults get ahead with their careers. Don't purchase a professional magazine that doesn't apply to that person, you will have just wasted your money unless you want to keep it for the next generation. Weather in a bottle: bottles of rain, snow, fog, and sunshine can sometimes be purchased. Give the bottle to someone in the house and they will take it outside to start the weather. This can be useful for hunting bugs, which like to come out in the rain. Other items may be added with upgrades, this walkthrough will be updated accordingly. When you pull up the personal status screen, there is a green button in the top left, just to the side of the picture of your family member. The button will say "Upgrade Me". 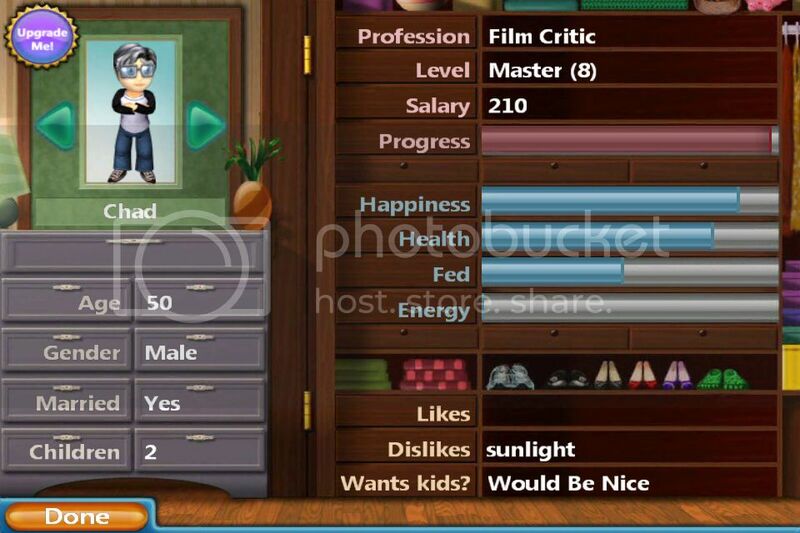 Here's a screenshot of the personal status screen. Click on the button and you will find some useful (and expensive) upgrades that can affect your person's personality and career path. "Systematic Desensitization" can be used to eliminate a dislike. This is handy if the person has a dislike that is interfering with their career. "Psychotherapy" can be used on a depressed family member to help them get better. "Higher Learning Classes" can produce "likes" in a person. "Advanced Career Training" can be used to jump a person one level in their career path. The price for this one goes up the higher the level of the person it is used on. "Career Change" can be used to completely change the career of a person. This can be useful to make sure both adults have careers using the same room, making career upgrades cheaper. My people are starving, and I don't have money for food! What do I do? Work on finding collectibles and winning trophies. There are easy trophies for praising certain behaviors, like pulling a weed or making a meal. Drop a person on a weed to pull it, then praise them for it. Drop a person on the kitchen table to start making a meal, then praise them for it. Winning each trophy is 25 coins. Collectibles sell for a range from 5 to 50 coins depending on the kind. As a last resort, you can purchase coins through the app store for real money, ranging in price from $0.99 to $99.99. Where did these ants come from? How do I get rid of them? You can find the answer to getting rid of the ants in Part 3 (the Puzzle section) of the walkthrough. It contains detailed instructions. One of my family members keeps getting sick, what do I do? If a family member keeps getting ill, this may be a symptom of an underlying infection. Buy the doctor consultation in the store and use it on the person. The consultation will let you know the illness and the treatment. Help, one of my people is really weak. How can I make them stronger? Weakness is a sign that their health is poor. Use the doctor consultation to see if there is an underlying illness that needs to be treated. You can purchase multi-vitamins and perfect fruit in the flea market (when available) and these will help strengthen health. Also make sure that you are buying organic groceries for the family. There's this constant beeping sound and a picture of an envelope flashing on the screen, what does it mean? It means that you have an e-mail. Drop the nearest person (adult or child) on a chair in front of one of the computers and they will pull up the e-mail. What is an event and how can I make one happen? There are two types of events, house and e-mail. 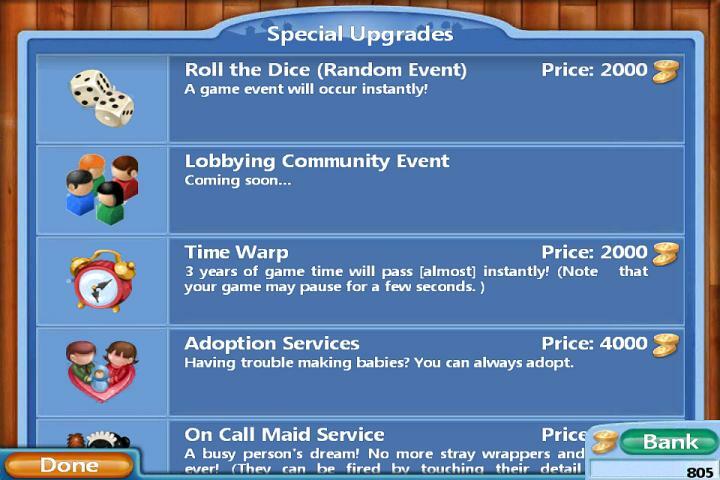 House events and e-mail events happen randomly, the only way to force one is to buy the "Roll the Dice" feature in the Special Upgrades menu. This will cause a random event to happen. One of my people is depressed, how can I cheer them up? There are a lot of ways to cheer up a depressed person. Buy an entertainment upgrade like the TV or a game (pool table, foosball table, pinball machine). Praise them for good behavior with the praising glove or with fruit or candy. If they are still deeply depressed, you can purchase psychotherapy in the personal upgrades menu. Mounds of dirt keep showing up in my yard, but when I drop one of my people on them they are confused. What gives? What you are seeing are the fossil collectibles. Your people cannot excavate them until you purchase a rock-hunter certificate from the flea market. The certificate shows up at random and costs 1,200 coins. How do I get my people to live longer? Only buy your people organic groceries. Be sure to feed them perfect fruit from the flea market when available. Make sure that your house has entertaining items for them to play with, and exercise equipment like the treadmill. Feed them multi-vitamins from the flea market and don't play when it is "night" in the game so that your people get lots of rest. How many trophies are there to win? There are 93 trophies right now, that may change with upgrades. I want to buy my family a pet, how can I do that? Pets will be available with a future upgrade. As of right now you cannot buy a pet. A box has appeared on my porch, what do I do? This is a random event. If you open the box you may find treasure or ants that will invade your kitchen. The choice is up to you. Help! The bathroom sink is shooting water all over the place, what do I do? You can check out the section in Part 3 of the walkthrough that covers household repairs. Okay, I've won all the trophies, now what? Well, you can buy more furniture in the store and redecorate and repurpose the rooms in the house to your hearts' content. You can enjoy watching your little family go through their day. And the developer has promised upgrades with new items, new puzzles, and other new stuff. Update in the App store! New update in the app store! This update brings pets to the gameplay, along with some bug fixes like the interest rate bug. New furniture in bright bold colors! Two new collections, bottle caps and a new fossil! Holiday Update in the App Store! Indoor holiday decorations including christmas trees, ornaments, lights, etc. Outdoor holiday decorations for the yard. A new set of collectibles. New holiday outfits for the family. Display food for the tables, use the items to lay out a fabulous holiday feast. New events and new behaviors! I haven't been playing long, but I find this second VF to be a rehash of the first. Whilst there are new features, there's nothing major to get excited about; particularly in light that fans have been waiting 2 whole years for a new game to be released. I bought all the VV series and the first VF and have been rather disappointed with the wait. Even more disappointed with the release. I think I'm finally over it and will instead be playing other games. Re-playability has always been a problem for me anyway. Once you get over the exciting "oh, how do I do this puzzle?" bit, there's not much left to get excited about in later plays. So basically...it's a budget version of the Sims game series? Looks good, but I wish it was on Android. I believe they are working on an android version, although I'm not sure when it will be out. They get paid immediately, but they only make about 1/100 of their salary each work cycle. For instance, if their salary is 45 coins a day, they will only earn about .45 coins per work cycle. They will have to work two or three work cycles for one coin to show up as earnings. If I buy something from anywhere in the store, but then decide I don't need/want it, how do I return it? I think I may have found another career that's not in the list provided. It's called 'Jerky Maker' and the starting salary is 60. How do i evict ? Why i cant drag the furniture to the house? I can't praise them when they're pulling weeds. Anyone facing the same problem? I also can't get that 'Need to Weed' trophy =( Is it a glitch? The english tutor has a starting salary of 45. How do I get rid of the pile of socks in my bath room I have a washer and dryer 37 socks how do I get rid??? I figured it out! You can sell furinture and stuff by putting it on the curb! That depends on the item that you've bought. Furniture can be sold by dragging it to the curb, the equivalent of a yard sale. Stuff you've bought like groceries or medicine have to be used. The evict button used to be in the settings area of the menu screen, it appears to have disappeared. Not being able to praise them while pulling a weed is a glitch in the game, it has been reported to ldw. Once you have a washer and dryer, drop your little people on the pile of socks in the bathroom and they will start to take the socks, one at a time, to the washer. Once they've delivered a sock, drop them on the pile again and keep it up until the pile is gone. Another profession: Jewelry smelter, starting salary 105. Thanks, it's been added to the list. Keep those professions and salaries coming! how many times do i need to put them to sleep until they are not tired anymore? My career is Jewelry Cleaner, starting salary is 60. So my family member just died at the age of 56 or 57. Is that somewhat young? I won a ton of groceries one generation ago, and the fridge stayed full when I passed the house on. Then I somehow gained a set or two of groceries, so I didn't buy fresh food for several days. But one of the sons emailed me (I think Dynamite did. Isn't that an amazing name! ), asking for new food. So I bought them fresh organic food and a few hours later, he died. Did the food harm him? Thanks for this page, it's helped me out a lot when I started playing. Shoe maker finishing salary is 690. Put your little people to bed, then close the game for at least an hour or so. You need to leave them alone when it is "night" in the game for a couple of hours so that they can get enough sleep. The organic groceries didn't kill your little person, they can actually help them live longer. 56 or 57 is fairly young, even in the beginning. He may have developed an infection that you didn't notice before it killed him. Thanks for the kind words. Keep checking back, the walkthrough and the salary list will continue to be updated as more information becomes available. I have a career not currently in your list: Coffee Critic. I think the start pay was 45, but I'm only at level 3 (and 47 years old so I won't make it all the way) and it's currently at 90. Also, the max earnings for Eyeglass Repairer is 300. At least I assume it is, I'm making 234 at lvl 7. I'm hoping for one more promotion email event before he dies. Those have been the theme for this generation, and the only reason he has gotten such a high lvl. Hi again. Thanks for writing a reply @grinnyp. It makes me more inclined to participate. Also, thanks for actively updating the career and salaries list. I always use it. Puzzle maker starting salary is 60. My people are refusing to pick up socks!! Help?? What is the max job level? My people always die by level 6-7. What can I do to reach the end? I get them to work on career as much as I can and buy the books and hope for events. Hey I've been playing LDW's games for so long and there have been quite some glitches since VF 1 (i couldn't get them to make latte) and now i don't seem to have any congo line of ants. i really hope something could help to fix this cause i've already bought $3 of coins. Ok, just confirming: Eyeglass Repairer max earnings ARE 300, I got lvl 8 at age 60, woot! My second generation isn't receiving any marriage requests. It's bee about three years of gameplay.. Is something wrong/is this happening to anyone else? How can I fix this? Thanks for the help! When you drop them on the socks, what happens? Do they shake their heads? Do they ignore the socks? Max career level is 8, which is master. That's where they'll earn their top salary. The more career upgrades you put in their career room (office, workshop, or kitchen) the faster they can make it to their max salary. With all the upgrades (possible in the fifth generation) they can make it to top salary by their mid-40s barring other complications. The ants are a random event, there is no predicting when they will come, and really nothing you can do to make them come. Don't panic, the requests may still come, they are random events. Check the router in the game, is it on-line? If the router is broken, e-mail won't come in. If you have questions about where the router is or how to repair it check out part 3 of the walkthrough above. It's been 3 days and I still can't get the nursing mother to let go of her baby. How long does it take for them to nurse anyway? Time seems to have stopped. I checked everything and my people move around but they never earn money or grow up. Help?! How old do the mother stop having babies ? Mothers should drop the babies about 4 - 6 hours after they are born. Either you've had the game on pause a long time or you have a glitch, they should not still be holding the baby after three days unless the game has been suspended in time with a pause. You should contact the vendor where you purchased the game and see if there is a fix. Do they drop it near where it was originally or does it disappear? Also, do you have the washing machine? The women stop having babies around age 50. Thanks for the prompt response! It's great you keep this walkthrough so updated! I have another question. I constantly get emails from my people wanting different food. I already get them everything: grains/fruit/meat/dairy. What do they want? New job not on the list: Fish Cleaner, start pay: 45. They drop it near where they picked it up and yes I have a washer. That's a generic complaint that they use when the food drops below a certain level, about 600 I think. Just keep getting them a balance of all four and they will be fine. That's definitely a glitch of some kind, I'd contact Last Day of Work to see if they have a fix. Grinny, Can you explain what the personal upgrade "Boarding School" does for kids? This is a little weird, but I was almost out of groceries (approx. 350ish left) and I closed the game for a few minutes when I went to get a drink. When I came back my food was at 4000+ and as far as I know, no money went missing. Is this normal or is it a (happy) glitch? My shower Is plugged up on the game and idk what to do! PLEASE REPLY CAUSE MY PEOPLE'S HEALTH IS GOING DOWN! The same thing happened with me. Idk but its a good thing! Basically it's a way to send the kid away. Once you send them to boarding school you won't see them again until it comes time to pick the next generation. This can be helpful if you want one less mouth to feed, or just want the kids out of the house so you can redecorate with a new multi-media room. Yes, that sounds like a happy glitch, unless you didn't notice a house event that gifted you with that much food. Drop your little people on the tools in the workshop and they will go repair the shower. Hi, there is this career called Film Critic. Messing with the time on your phone in order to affect the game is a very bad idea. There have been reports of some major problems in the game caused by this, it can really mess things up. Samanthadrobena- thanks so much 4 the time cheat! Everytime I try it it doesn't effect my people but it gives me 800,000 coins and 1,000 food! Thanks! They will ask for different kinds of food as a generic complaint, even if they already have food. So I am missing 2 bugs and 1 piece of the bone collection and I cannot seem to be able to get them!!! I look and look when it rains but to no avail...any ideas?? Just a correction to your jobs list. The Marketing Agent start pay is 105, not 90. Disregard my last comment about the Marketing Agent, I didn't notice that the person was starting at lvl 2. I didn't notice some marriage proposals come starting at lvl 2 instead of lvl 1. Plz help! My oven is on FIRE! HELP ME BEFORE MY PEOPLE DIE! I found an orange thing by my trashcan and when i drop my people on it they say they need something else first what do i need to pick it up?? How long does it take for people to age a year? I'm hoping my couple dies soon (that sounds so bad!) so I can get to the 2nd generation now that my 3 kids are in college. Just curious, but how often do you figure adoptions occur? I've had three in five generations, including the most recent one where the parents were in their late 40's. The collectibles are random, there's no way to make a specific collectible appear. If you want to spend real money you can buy the lucky rock from the app store, it makes collectibles show up more frequently, but it won't necessarily make a particular one show up. There are fire extinguishers in the workshop, behind the left workbench. Simply drop your little folks on the extinguishers and they will do the rest. If you are seeing orange peel beneath your trash cans, you must also have an infestation of ants in the kitchen. Check section 3 of the walkthrough above (puzzles) and look for the ant puzzle, it will explain what to do with the orange peel. They seem to age about 1 year for every 2 hours of play. I'm on 6th generation, and have had an adoption event occur three times, so I would guess every other generation? Seems like my family does well with adoptions- I just got another one in my family. Now this current generation has two adopted children. The parents are rather old as well- mid 50's. Maybe it's more random than I thought. Ok so my daughter is having problems with her VF when she buys furniture she cannot get it out of the decor section so she cannot put it I'm her house. Anyone else have this issue? New problem!!! My people have completely stopped aging!? Hi, I purchased maid services and she has disappeared. The home is a mess. How do I get her back? Is it normal for the whole family to get sick at the same time with no prior notice/notification? Hi, I have a problem with my money. When my last generation died they had 5500, before I went to bed it had dropped to 4500 and now this morning it's only 1800. I haven't purchased anything as I am saving. Does anyone know what is happening and will I lose all my money? I've always wondered, but is the foreign candy a trick candy or a treat one? Are the maid and gardener a one time hire price or recurring? Generations means how many generations of your family have lived in the house. First generation is your original couple, second generation is one of their kids, third generation is one of their grandkids, etc. Have you been messing with the time settings on your phone or iPad? One of the things that can mess up the game is changing the settings in an attempt to make time run faster. The maid should come back every hour or two, or when you open the game again. If the maid never returns this is a glitch and you should contact Last Day of Work about a fix. Yes, just like in real life, it can be very common for the entire family to get the same illness. If one of them gets sick and isn't treated pretty quickly, they can pass the illness to others in the family. Have any events happened that can account for the missing money, like an IRS audit or the like? If not, you may have a glitch. The foreign candy is a trick candy. The maid and gardener are a one time hire price. Once you hire them, different maids and gardeners will show up during the day to clean and/or weed, but it won't cost you anything past the initial outlay. The new update in the iTunes store should fix the problem with the furniture. I put my family to pick up the wrappers but the act confused what do i do? And also they are always weak why? Make sure that there is nothing blocking the path from the wrapper to the garbage can. If you've put a couch or something in the way, your little people will get confused (this can also happen if there is something blocking the way between a sock and the washing machine). If your people are weak, make sure that they are eating regularly and that you are feeding them organic groceries. If the flea market offers vitamins or special fruit, buy that to give to your little people as well. If you can afford it, buy some exercise equipment for them to use, it will help them stay strong and healthy. I'm having a bit of a problem trying to clean my floors and table, any ideas? I really like the gothic bed but there is no other funiture to go with it and the bedside tables look stupid because they're to tall. Any idea if they're adding to this furniture type or any suggestions on furniture to accompany it. Keep trying. If they start arguing, just pick one of them up and drop them on the other over and over, don't let them finish the argument. Eventually they will try for a baby. As far as I know, a model builder will not build/clean rooms. Cada la persona sulla casella degli strumenti in officina e dovrebbero fissare il rubinetto. If both parents are working in the office at the same time, the computers are considered "occupied", even if the person isn't sitting at them at the time. However, the collectible should still be sold, you should still see the money come in, even if the kid is shaking his/her head. The sawdust is just part of the background. When you see someone wandering around the office and touching stuff, they are trying to work. If they shake their heads, then the work cycle did not complete and they didn't earn any money. You will see this a lot when they are in the early stages of their careers. Have you found multi-vitamins in your flea market? Those can help with weak kids or adults. That just seems to be a random behavior. This sounds like a glitch. Try contacting Last Day of Work to see if this is a known bug. Only Last Day of Work knows, but they continue to update the game so perhaps matching furniture is in the future. I have been playing VF11 for several months Android version. I'm on 16th generation but have not been able to drop a person on the cinnamon pile to begin the process of eliminating the ants. I tried updating the game but instead just got a whole new game. I spend about $20.00 a month and now have doubled this amt since having two games. My people don't seem to collect their salaries so I have to supplement. Any ideas on the ant problem or salaries? I do allow them plenty of time to work. i used to sign in to my game with Google +, i hope with connect to G+ when i reinstall it , I can restore my achivement and money. my little friend had already 10.500 money in that game. And today my game's graphic was broken. so i decided to reinstall it. but when i played it,,it started from the first time.my money is missing. i dont know how to restore my achivement with G+. please help me to restore it.thaanks..
i used to sign in to my game with Google +, i hope with connect to G+ when i reinstall it , I can restore my achivement and money. my little friend had already 10.500 money in that game. And today my game's graphic was broken. so i decided to reinstall it. but when i played it,,it started from the first time.my money is missing. i dont know how to restore my achivement with G+. please help me to restore it. thanks. You do NOT need the blue tool box to perform household repairs. All I ever did was show somebody the problem (if they weren't panicking over it already), then drop them on the tool table in the middle of the workroom. P.S. But thanks for all the other useful advice! I came across a random event that may reveal part of the storyline, just thought I'd share. Of course you are right, I see it now. We will have so many children. We will of course, continue construction of the house with all haste. I am sorry I ever doubted you. I got my house, adopted my little person, cleaned up the socks and wrappers and picked all the weeds... first generation is very old now and second generation of 6 children have started going off to school and I have not had even a single weed since the initial ones were picked. Not one. I even jumped forward 3 years and still no weeds in the yard. How do I get the weed puller badge if there's never any weeds? I've looked through all the comments and can't find anything about clothes. When I try to buy a new outfit for my person, sometimes it will say "you already have this". Where are the clothes I've already bought being kept? This morning I put one little person on a sock and he picked it up and did what he was supposed to do. Right after that I picked up another little person and put them on a sock in the blue room and a notice popped up on the screen with an arrow pointing to the washer saying that something is in the way and has to be moved first. I took a screen shot of it it can't post that here. I've picked up other socks since this morning and they all get put in the wash but I try to pick up that one in the blue room and I get the same error message saying there's something in the way. What's up with that and how do I fix it or do I have to live with one sock on the floor? recently the mom died of old age and the husband survived her but I could still start a new generation by going to Family. I have a maid and a gardener - they pick up the wrappers, socks and weeds right? But this doesn't increase the amount of wrappers, socks and weeds I have picked up in the 'goals' section. In order to complete the goals do I have the fire the maid and gardener and do it all myself (with my family)? My little boy character disappeared after his parents passed.??? I was just wondering what to do next. All 5 kids are gone to college. The parents passed away and the only two living things are my cat and dog. So what do I do now? Am I waiting for one of the kids to come home or do I have to start the game? HELP PLEASE!!! To start a new generation go to menu/family at the top of that screen should be a button that says "New Generation" tap on that and chose one of the children to start a new family. Ok, here's my dilemma. I can't seem to find a match for "A Perfect Match" goal. I am so many generations in that I have to delete one at the top in order to add another. I have $87844520.00. The only two goals I'm missing are "A Perfect Match" and "Ohhhhh dear...You had triplets". Any idea why I'm having so much trouble getting these last two goals? The problem with the perfect match goal is simple, there are over 130 careers in the game, so the odds of finding 2 people with the same career are pretty slim. As for the triplets, it is completely random and all you can do is keep trying. Correct, anything the maid and gardener do does not count towards your total, you would need to fire them and do it yourself until you reach the goal. I just started my second generation and my person will not check or send emails. I've dropped her on the site multiple times but she just shakes her head no and walks away. What do I do? Lately when I tap to go to the menu I am getting a pop-up ad. One of the was for radiumone, a tracking company for business ads. Has something imbedded itself in the app or was this added? Before this the only ads were by the video ad at the top that you get 4 videos 2 or so times a day. I had to re-purchase the game after my computer blew up. Now there are no in-game purchase items. Like the 'Lucky Rock' and money bundles. Is this a glitch? I did get the game from Big Fish Games so is this maybe something on their end? My other Play For Free games are still working. I'm very confused. Valuable post - I Appreciate the points ! Does anyone know if I can grab a template CA CALOSHA Form 5021 form to work with ?